Everyone knows there’s more to PC gaming than having a good computer and games to play on it. This gaming computer is surrounded by a plethora of accessories and other gear to give you comfort, control, and ensure the battles go in your favor. Whether you call it your battle station, your gaming rig, your man cave, or your lair, it’s important that you have the right gaming gear. 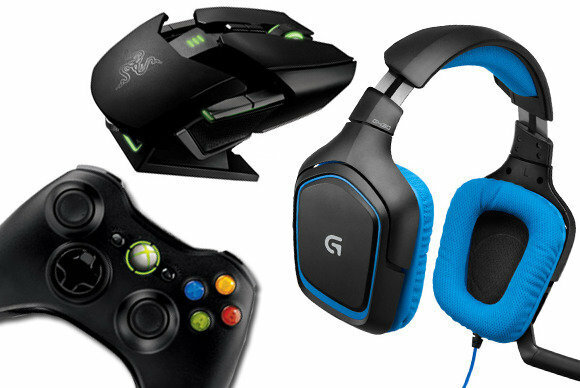 Here’s a look at how to choose the ultimate gaming accessories for your rig. After choosing a gaming PC you’ll need to choose a monitor. You want something better than the generic monitor you can find anywhere. While certain gaming desktops are bundled with monitors, and laptops have them built in, you still want one that offers everything you need and delivers high detail. Gaming displays should be able to handle the high speed, detailed images that move across the screen at any resolution and size. You don’t want to be left with a blurry screen when the action intensifies. You could get away with something smaller, but gaming is best enjoyed on a large screen. Get a monitor that is at least 20 inches across diagonally and explore the worlds of your games in style. The keyboard reigns supreme in PC gaming. There are dozens of keys and an almost endless supply of commands. That’s why gaming keyboards have been designed for more than just typing. Gaming keyboards have precision parts and other powerful features designed for gamers. Mechanical keyboards have become the norm for gaming, providing durability and reliability, and a level of tactile feedback that can’t be found with generic keyboards. Mechanical keyboards also allow for more Actions Per Minute, allowing users to make more commands in an instant. These reliable responses and rapid actions can make all the difference in a firefight. Gaming keyboards have a range of other features, including backlights for playing in low-light conditions and swappable kepcaps. This lets you color-coordinate your keyboard to make control easier. They also offer dozens of programmable commands and macro keys that can be programmed to execute scripts for faster and more responsible commands. There are several games where a keyboard and mouse isn’t enough. There are times you’ll need something similar to cabinet mounted controls of an arcade, or a simple controller-style gamepad. Whether you’re playing a fighting game or a side scrolling action game, gamepads with automatic controls such as joysticks and arcade-style buttons give you what you need. You can find these pads for your computer and, much like keyboards, they can be programmed however you want. There are even programs that can take mouse and keyboard controls and convert them to gamepad controls for you. Much like a gaming keyboard brought gaming to the mundane keyboard, a gaming mouse is made to be better than a generic point-and-click mouse. Gaming mice come in all shapes and sizes, but even the most basic ones have ergonomic construction, optical sensors, and high-quality button switches. They also tend to have adjustable shapes, sizes, and weights, allowing you to adjust your mouse until it’s a perfect fit for your hand. There are several different kinds of gaming mice, each optimized for a specific genre and style of gameplay. The most basic gaming mice are known as FPS mice. As you might guess, they are made for first-person shooter games. They have standard left and right buttons, but they utilize light-clicking for faster attacks, with ratcheting scroll wheels to switch between weapons smoothly and quickly. You’ll need to do more than just aim and fire with MMO and MOBA games. That is why mice designed for those games offer thumb-buttons. Some of them have numeric pads built in to allow you to launch attacks, cast spells, and use items with precision speed and timing. Don’t forget that games are about much more than just the visual. Whether it’s atmospheric music that sets the mood, or the crunch of footsteps warning you of incoming enemies, you want to hear every sound in a game in clear detail. That’s why you want a great pair of speakers for your battle station. IF you want to truly immerse yourself in a game, talk to your teammates, and keep track of enemies, then you need more than speakers. You need a headset or gaming earbuds. These combine high quality headphones with a microphone and they are quickly becoming one of the most important accessories for online gaming. They also work great when you want to turn up the volume, but you don’t want to disturb the people around you. There are two choices when it comes to headsets and earbuds; you can go wired or wireless. Wired ones tend to be less expensive, and being wired to the computer means that they have more power. Wireless headsets give you more freedom though, allowing you to stand up and move around without any problems. Take a look at this selection of the best gaming earbuds and choose the right ones for you. Gamers and gaming accessory manufacturers alike are always looking for anything that can give them an edge. With our guide you can put together a pretty solid battle station for playing games offline and online. Keep an eye out as new products are released all the time to make gaming more comfortable, bring the game closer to you, and give you more control than ever before. Next articleHPE0-S51: How to Pass the Exam at the First Attempt? I haven’t really bought anything fancy gaming accessories, but maybe i will in the future. Serenia Fantasy CBT Key Giveaway!